Longboards offer bigger, softer wheels than traditional skateboards and shortboards, which makes daily travel and manoeuvring much easier. Unlike their cousins, they are designed to be ridden on uneven surfaces and are suited for harsher terrain, making them a popular way to travel in urban areas. 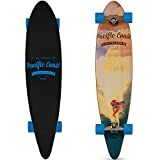 Finding the right longboard for your height, skill, and needs is important. To help you make that choice easily, we have put together this longboard buying guide. Pintail Shaped Longboards: Modeled on the shape of a surfboard, these boards are built for directional riding. Their sharper tapering offer larger wheels for better turning and balance needed for carving. Fishtail Shaped Longboards: Similar to pintails, these boards are shorter with a split tail. These shaped decks are often used for cruiser and mini cruiser boards. Blunt Shaped Longboards: With a traditional skateboard feel, these boards more often than not have noses that are longer and wider than their tails, with added kicktails for more control. Used mostly for bowls, banks, and transition riding. Twin Shaped Longboards: Mimicking traditional trick skateboards, these boards offer more stability for slashing banks and cruising. 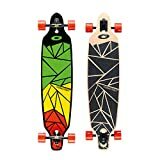 Cutout Shaped Longboards: With drop-through trucks, cutout boards are lower boards built to be more stable at faster speeds. Normally found on freestyle, freeride, and downhill boards, they offer more wheel clearance than other longboard shapes. Drop Down Longboards: Normally including a cutout shaped deck, this is a longboard build that sets the deck higher at the nose than at the tail offering better stability and easier pushing. Drop-Through Longboards: Offering better stability, flex to make longer rides more comfortable, and easier pushing, these long boards have a lower gravity center. 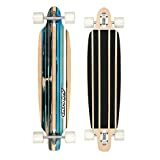 Cruiser Longboards: Including a kicktail and medium in length, these longboards are the easiest to navigate through crowds and on sidewalks. Their smaller build makes them more portable, easier to push, and they are a convenient choice for day-to-day traveling. Mini-Cruisers: Smaller than longboards, and often less than 33 inches long, these boards are a compact choice for short distance commuting. With the added convenience of being small enough to fit into a backpack, they are a popular choice for work-to-home travel. Carving/Commuter Longboards: These longboards offer the greater flexibility needed for carving. Carving is a style of longboarding similar to surfing or snowboarding. Carving boards have wooden, fiberglass or carbon fiber decks and smooth enough trucks needing for carving. 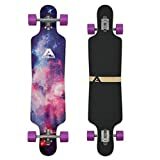 Downhill/Speedboarding Longboards: With thick decks, frictionless bearings, and good grip wheels, downhill longboards are built with extra stability for handling higher speeds. 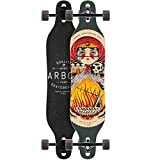 Freeriding Longboards: Freeriding longboards are normally drop-throughs with wheels up to 76mm in diameter that are ideal for sliding and thrashing. 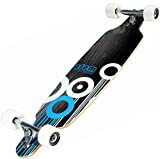 Dancing/Boardwalking Longboards: These boards have long decks that are mostly concave with a kicked nose or tail, allowing users to accomplish tricks and maneuvers on the deck. 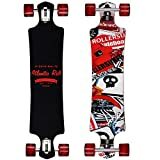 Slalom Longboards: Normally between 30 and 36 inches in length, these boards are concave with a non-functional kicktail or footrest and are suited for moving downhill. 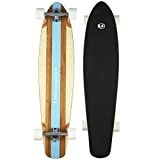 Long Distance Longboards: Long distance longboards have dropped decks and elongated slalom board builds making them perfect for long distance skating and pumping. Value for Money: Good quality boards for entry level prices are an ideal choice for beginners. A lot of online reviewers bought their boards as beginners, as gifts for beginners, or for getting from A to B, and they rate boards that offer exceptional value much higher. Durability: Boards that stand the test of time and survive miles of riding are reviewed well. This is especially true when extra bumps are expected, such as for beginners or intermediates looking to increase their skill. Build: Wheels, trucks, bearings, and build all contribute to the way a longboard handles and therefore owner satisfaction. Choosing a quality brand with quality parts will ensure you will be satisfied with your purchase. Rides: Boards that offer smooth rides, easy turning, and have good balance are crowd pleasers among longboard owners. Boards that can handle tricks, cruising, and downhills are the most popular choice. Firstly, consider your skill level when choosing your board. If you are a beginner, choose a board that is durable, with big soft wheels, smooth bearings, and a longer, wider build as a starting board. Someone with more experience may want an intermediate drop through board where more tricks and movements can be performed. Board shapes also play a role: Pintail shaped boards are a popular choice for beginners while cruisers, similar to skateboards with kicktails, are better for intermediate riders. Your deck width will determine how stable or responsive your board will be. The wider the deck, the more stable it will be, while thinner boards are a lot more responsive. How much flex do you want? The longer the wheelbase, the more flex you will have. Longboards come in a variety of materials including: maple, which is durable and can withstand a beating; carbon, which is best suited for riders with previous boarding experience, is a lightweight choice; bamboo, which is favored by environmentally concerned riders and an ideal deck material for carving; and finally, fiberglass, which is often used with bamboo or maple for added stability. The deck rail is the edge around the circumference of the deck and can be rounded, sharp, or beveled - all three often being included on different sides of the same board. Longboards differ in the way their deck flexes. There are three main types: longitudinal (bend from nose to tail), lateral (bend from side to side), and torsional (which is a mixture of lateral and longitudinal) flex. Each board will include a flex rating, ranging from soft to stiff, and choosing between them will depend on where and how you will ride. Downhill boards, for example, will need no flex to remain stable. 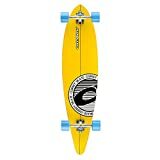 The longer a longboard’s deck length is, the more stable it will be. The shorter the length, the quicker it will be to carve. There are three kinds of deck mounts you can choose from: top mount, drop through mounts, and drop through flush mounts. Top mounts have higher ride heights which makes them turn quicker. Drop through mounts are often found on cutout boards offering more stability and a controlled response for freestylers. Drop through flush mounts are less mainstream and are normally not found on completed boards. Longboard kicktails make turning, tricks, and pavement jumping easier and offer additional stability when cruising on flat surfaces. Let’s talk wheels. The thickness of a longboard’s wheels determine how it will handle certain surfaces. Diameters from 54 to 59mm are good all-rounders for beginners, and anything over 60 suits downhill skating. Wheels can be either rounded or, less commonly, straight edged. Straight edged wheels are ideal for downhill as they offer more grip, and rounded wheels are more easily available and are suited for flat cruising, carving, and sliding activities. Yocaher: Offering custom and complete long and skate boards, Yocaher was established in 1975 to cater to all types of skateboarding needs. From beginner to professional, Yocaher offers a wide range of board types. Their complete skateboards and longboards come equipped with the deck, trucks, wheels, and bearings. Sector 9: Starting by manufacturing skateboards in their backyard in 1993, Sector 9 is now a leading skateboard and longboard brand. Gold Coast: Based in California, Gold Coast specializes in longboards, cruisers, and transition skateboards. Their approach to their products, whether it is a longboard, wheels, or even a t-shirt, is to convey a sense of fun with quality design and materials.